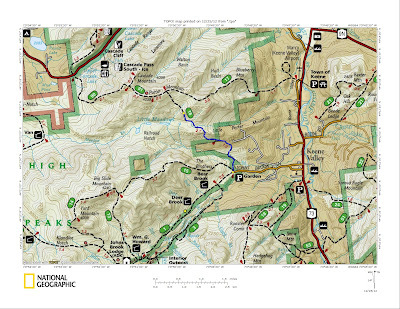 Cascade & Porter Mountains, located between Lake Placid and Keene, NY are the easiest Adirondack high peaks to climb. They are also probably the most climbed peaks due to their accessibility. This doesn't make them lesser mountains. Cascade has a great open rock summit with fantastic views. Porter is treed, but some views are possible. They are also a nice pair to hike on a winter day. On this last day of 2012, it was in the mid 20's and the sky was kind of funny. There were pockets of sun, pockets of dark clouds, and where I was, it was socked in with clouds. Leesa was working today and we were going to let our dog Rev stay home with her to rest. Rev had been breaking trail for 5 straight days and we thought she would appreciate a day to sleep. Quite wrong. Rev didn't like the thought of me going without her and she made herself known by squeezing between me and the door. Along came Rev. That caused a change of plan. 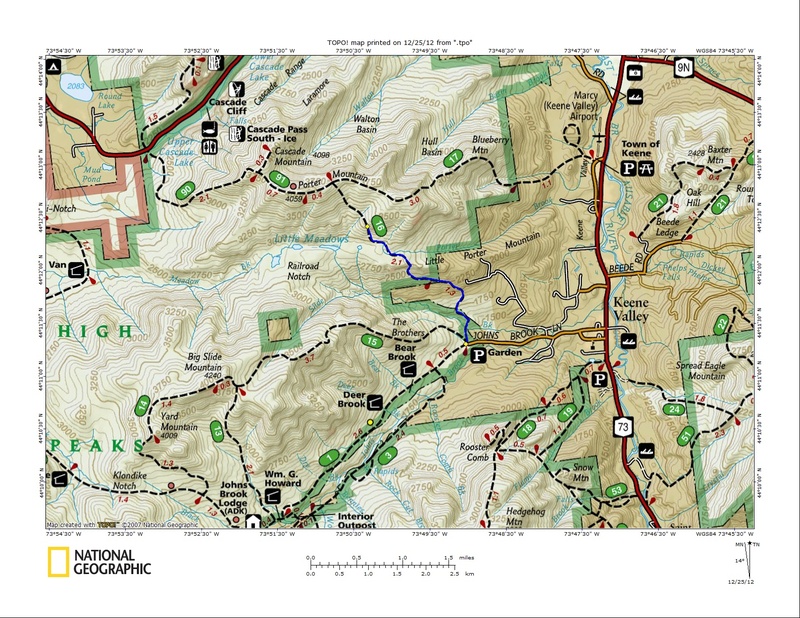 I was going to at the Adirondack Mountain Reserve in St. Huberts and ski the lake road to the Weld trail, then climb Sawteeth. It would be a good option since dogs aren't allowed on AMR property. Since Rev "needed" to come along, Cascade and Porter became the new plan. I've been up Cascade and Porter many times, but never during the official winter season, so these 2 could increase my winter count. I arrived at the trailhead at 9:30. There were 5 cars ahead of me. The summit. No visibility at all. As Rev and I began to to climb the rocky summit cone, it was if we were stepping into a cloud, a snowy, windy cloud. You could no longer see anything. Even snowshoe tracks from minutes before were gone, windswept. The summit had no familiarity. I had to walk carefully to make sure I knew where I was. Rev was surprisingly willing to go up to the summit, but we didn't stay long. At the top, we did an about face and quickly retreated to the cover of the trees. In a minute, we were back to the trail split for Cascade/Porter. 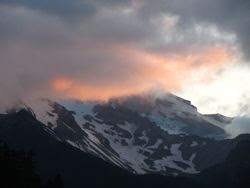 I noted that while the Cascade trail had been stampeded, the Porter trail had only been broken in by several persons. I thought the walk to Porter was extremely beautiful, and in fact a nicer walk than in the summer. One of the couples I saw along the way left there packs at the Cascade/Porter trail junction during there trek to Porter. When they got back to there packs, and went to have a snack, they found out that a rodent had eaten into some of their trail food! The Porter Mountain summit is treed and nicely sheltered from the wind. It is a nice summit to enjoy the current winter wonderland. Once back to the trail split, Rev and I bombed down the mountain. (She pulls up the mountain and down)! We were back at the car in less than an hour. Last winter I was working at Gore Mountain one day and I ran into former DEC forest ranger Steve Ovitt. We got to talking, and he told me about some of the fine xc ski trails in the Siamese Ponds Wilderness Area of the Adirondack Park. 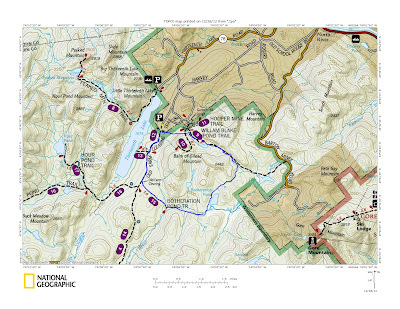 In particular, he described the new (2010) ski trail called the Botheration Pond ski trail loop. 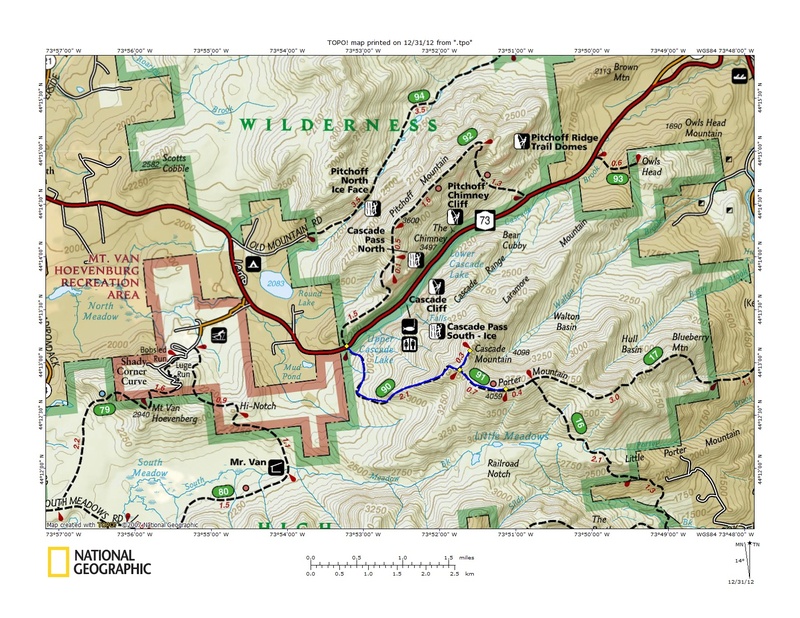 An ~ 8 mile loop trail beginning and ending at the Old Farm Road trailhead, near Thirteenth Lake. I stored that information away for future reference. Of course last winter we didn't have favorable xc ski conditions, so I never made it out there. 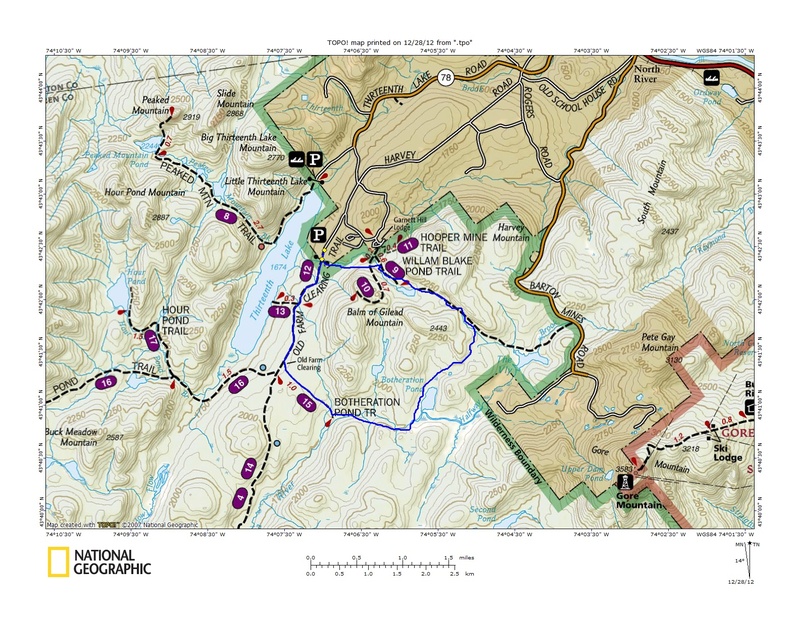 During the summer I read a blog post by Harvey Road - The New York State Ski Blog about The Botheration Pond Trail. Thanks Harvey! 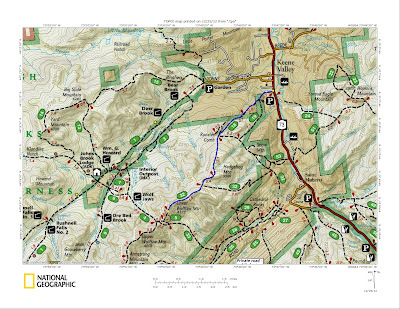 Included in his fine writeup was a link to a nice map showing the trail system. Today, one day after getting a foot of snow, Leesa and I headed for the Old Farm Road trailhead. We were the 1st ones there at 8:30 AM. The road had been plowed, and was easily driveable. As we got ready to start, we were happy to see someone had broken trail late yesterday. That would aid our progress today. We continued on, breaking trail. 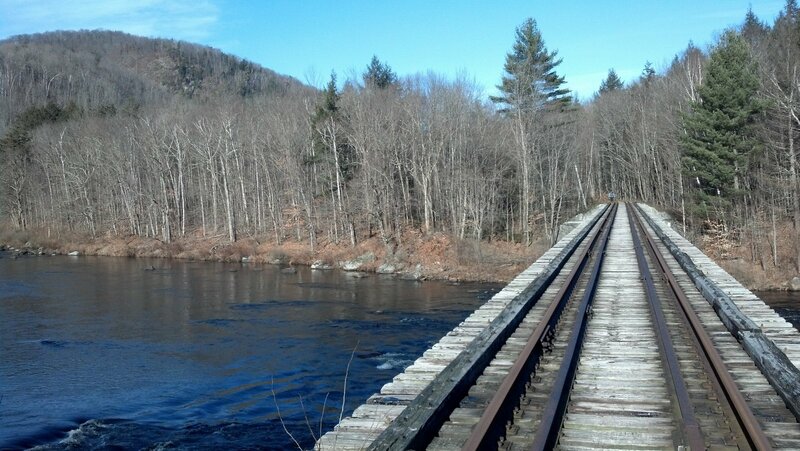 We soon reached the new (2009) 55' bridge over the east branch Sacandaga River. Quite nice and impressive! There is also a designated campsite on the western side of the river, just prior to the bridge. It was a little slow going breaking trail. Rev was out front and tried to do it for us, but she didn't quite pack it down nice. 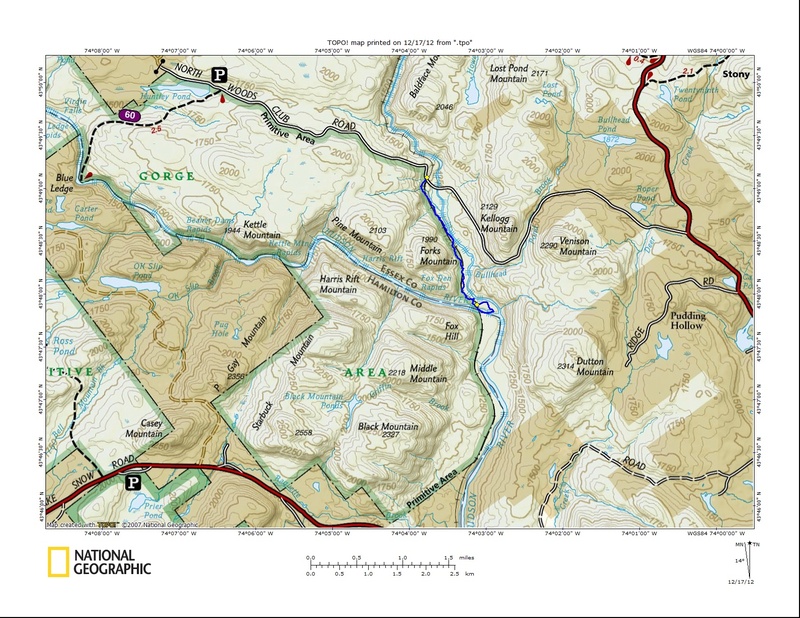 We continued on until we reach the western side of Botheration Pond. The pond is about the halfway point in the loop. We turned around at point, since we didn't think the rest of the trail had been broken out, and we wanted to enjoy the fruits of some of our trail breaking. It turns out that when we got back to the kiosk, someone else had started the loop in the clockwise direction. Maybe we wouldn't have had to break much more trail if we had continued. Great to finally have a good fresh dumping of snow on the ground. It's been a long time. We both enjoyed this area immensely, and we'll be back to ski here again. When we got back to the car, 5 other cars were parked at the trailhead. Perhaps more trails will be broken out soon. I suspect so. 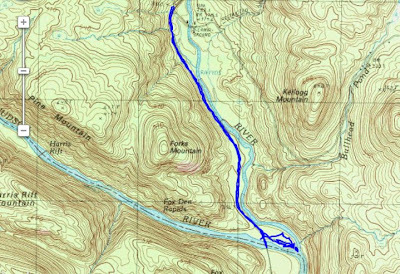 I know tomorrow I'll be back to ski from the Old Farm Road trailhead south along the east branch Sacandaga River to Eleventh Mountain on Route 8. This will be another new adventure. 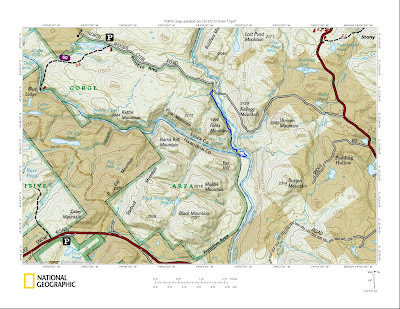 Here is a topo map showing our route for the day. As I said on my last blog post, Leesa and I had our Christmas with family on December 23rd, so the 24th and 25th became hiking days! Today we wanted to climb Porter Mountain from the Garden in Keene Valley (a new trail for us). If all went well, we would continue on to Cascade Mountain. We didn't get a very early start today. We reached the Garden at 9:30. We were the only car there! Unbelievable, even for Christmas Day. There were some cars parked at other areas...3 at Roaring Brook, 4 at the Ausable Club parking area, but we were the only ones at the Garden. Usually we are looking at a full parking lot. I expected we would be breaking trail and that it would be no small task. Once again, the first mile was easy with just 1-3 inches on the ground. We bare booted the first mile. At the old shed building shown below, we put on our snowshoes. It was a pretty day out. I wasn't expecting full sun and blue sky, but that is what we got. It was in the mid 20's with no wind. Thank you Jim Goodwin for all you did for the Adirondacks (and the Goodwin family continues to do). As we approached Little Porter Mountain, the snow on the ground went from 4" to a foot almost instantaneously. I had not been on Little Porter before, and it has great views.... the Great Range, Big Slide, Noonmark, Round, Giant & RPR can all be seen. As we stepped onto the summit of Little Porter, there was a bank of clouds to the south and we couldn't see much in that direction. It quickly lifted, and within 5 minutes we could see in all directions! Pretty amazing change. 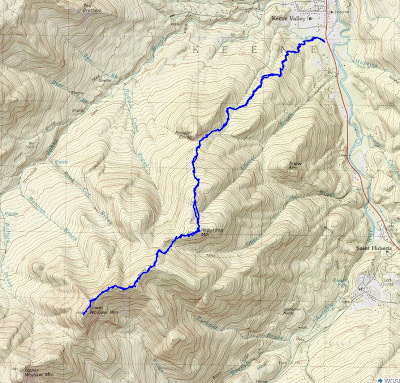 Once we left Little Porter Mountain we travelled a short way before we ran into 2 different spots where we couldn't follow the trail and each time spent 15 minutes or so scouting for a trail marker. The snow was now a foot deep and there were no tracks or traces of the trail. Each time we eventually found the trail, but we lost some time. At about 3300' we decided to call it quits. The sun was hitting the south side of Porter where we were and softening the snow so it was getting heavy to break trail. It was easy to go back down following in our tracks, but it would have been a tough haul to climb the last mile to Porter. We'll save it for another day. If you haven't been to Little Porter, it's worth a look. That view made our day. I was fun plodding through the snow too. We really didn't mind getting turned back shy of our goal of Porter Mountain. There's always another hike. Our family Christmas gathering this year was on December 23rd, so that meant the 24th and 25th would be hiking days. Leesa worked on the 24th, so I made plans to hike with my dog Rev from the Rooster Comb parking lot in Keene Valley, NY to the summit of Lower Wolfjaw via Hedgehog Mountain. 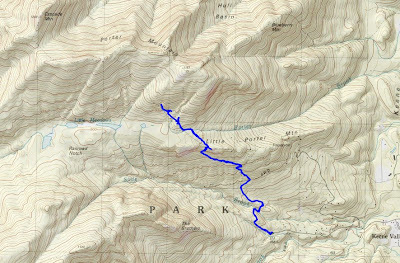 I had been on LWJ three times previously ( the most recent was 12/17/11, under similar conditions), but never on an official winter ascent. If all went well, I was going to continue on to Upper Wolfjaw. I had climbed LWJ from every direction except the trail over Hedgehog (a new summit for me), so that was the obvious choice this time. I knew their was a good chance that I'd be breaking trail on this one, and that was the case. I got a decent start and was on the trail at 7:30. There were no cars in the lot and I didn't think I'd see another hiker all day. There was next to no snow at the trailhead. By the time I got to the Hedgehog/Rooster Comb split, 2 miles later, there was 4 inches of snow on the ground. I stopped to put on my snowshoes and continued on. Shortly thereafter, at about 3000 feet, the snow depth quickly increased to about a foot. My pace slowed to about one mile/hour as I broke trail in the foot of fresh powder. I really was pretty to see all the snow, and certainly a great change from last year. I went up and over Hedgehog (no real views there) and continued on. There is one pretty steep pitch that was icy underneath the snow and I had to find branches to hold on to as I hoisted my way up. With my travel being slow in the powder, it took me 4 hours to get to the summit of Lower Wolfjaw. It was 11:30 and I contemplated whether I should continue the 1.5 miles to Upper Wolfjaw or not. I estimated it would take me 2.5 hours to go there and back. That would put me at 2 PM. I knew I would descend faster than the 4 hours it took me to climb, but being alone, I didn't want to push at top speed to do this, and I didn't want to come out after dark on Christmas Eve. I made the decision to just have a leisurely return trip and enjoy the snow. It did turn out to be a quick descent and I was back down in 2.5 hours. I'll save my winter climb of Upper Wolfjaw for another day. I was back a the car at 2:05 PM. It was a nice day weather wise. It wasn't quite the sunny day that was predicted, but it was pretty nice. Temps were in the 20's and there was no wind. Rev had lots of fun bounding around in the deep snow. Her legs weren't long enough to keep her belly from bottoming out in the snow and she kicked around like a donkey to keep moving. She had a nice snow beard at one point, but I wasn't able to get a picture of it. All in all, it was great to have the snowshoes on again, and I had them on for about 6 miles with a good workout breaking trail. I did see one woman heading in when I was between LWJ and Hedgehog. No other hikers on the day. 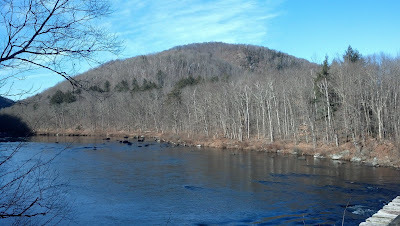 Our travels Saturday took us to the Hudson Gorge Primitive Area. Leesa and I took Route 28N from Minerva to the North Woods Club Road, where we followed the gravel road west to where it crosses the Boreas River. 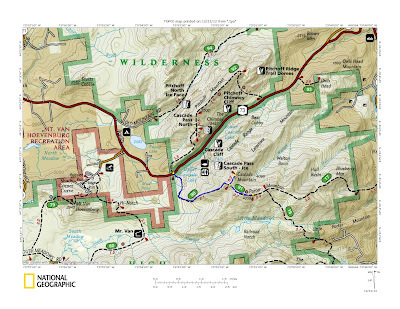 There are some fine designated camping locations in this area, some alongside the North Woods Club Road, and others accessible by a short hike. Immediately west of the Boreas River, the old train tracks to Tahawus remain. The tracks were purchased from National Lead by Iowa Pacific Holdings Company in 2011. Iowa Pacific plans to reopen the tracks all the way to Tahawus to remove the waste rock from the closed mine. This past summer crews did brush and tree removal work in this area. All trees and brush in the vicinity of the rails were cut and piled off to the side of the tracks. 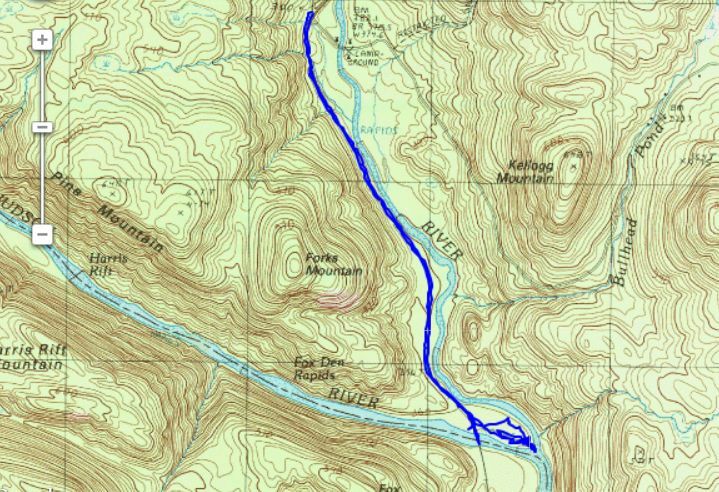 Our visit wasn't to inspect the tracks, but rather to hike to the confluence of the Boreas and the Hudson Rivers. There is a substantial peninsula at the confluence and in reviewing the map, I thought it would be an interesting area to explore. It was an easy 1.5 mile hike south following the tracks. Just prior to the railroad trestle over the Hudson River we turned east to proceed out on the peninsula. About 3/4 of the way out on the peninsula, is the lone designated campsite. It's a nice location in the pines with a firering and﻿ some generous real estate to locate a tent. It is also close to the water. Farther out on the peninsula is another apparent campsite, also with a firering, but there is no camping disc at the location. Since it is within 150' of the water, it is an illegal campsite. Just beyond is the point itself. As we approached the point, I saw 3 deer off to my left. As they made a dash to leave the point and get away from me, my dog Rev, being the hound that she is, gave chase. Fortunately I was able to call her back using her remote collar. Out at the point... what a spot. An impressive view of the mighty Hudson and the Boreas coming together. Well worth a visit. Great for a picnic, or camping at the designated site, or just out watch the rafting in the summer. 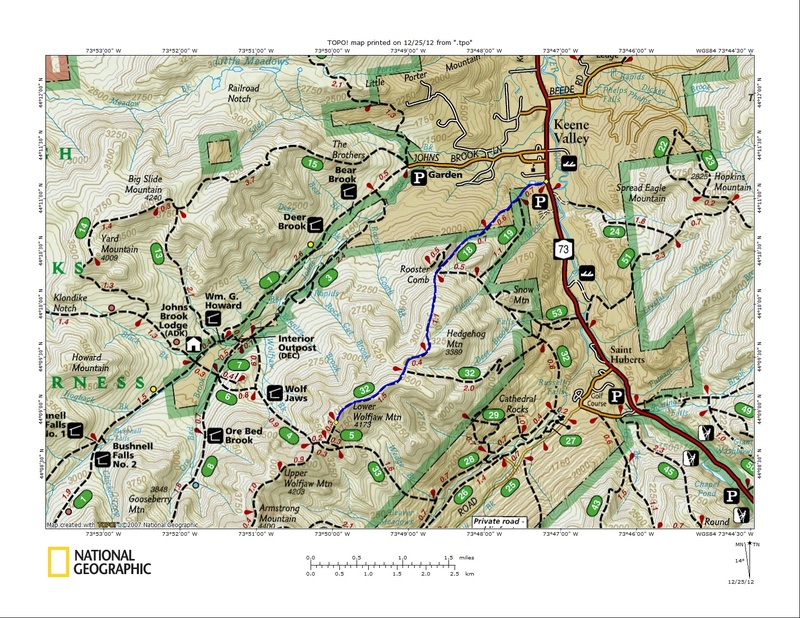 It's interesting to note that the eastern boundary of the Hudson Gorge Primitive Area appears to be the location of the railroad tracks, therefore the peninsula is just outside the primitive area boundary.